Down jacket and Filler bag make a versatile system day and night. This is a multi-purpose system, offering a number of options in camp or on the mountain. When the weather's warm, the Filler can be used as a stand-alone bag for camp or bivvy. It also works as a bivvy option at lower temperatures with the Alpine Ultra jacket. And if nights in camp turn really cold, slip the Filler bag inside the Hispar 400 and it will boost performance from -9°C right up to -19°C. For daytime use the Alpine Ultra jacket has been called ‘the perfect alpine downie’ and the Filler bag makes a versatile partner. Weighing just 240g, the Filler makes an ultralight bivvy bag on its own. In colder conditions you can fold down the Filler to double thickness and pair it up with the Alpine Ultra jacket for a bivvy down to about 0°C. In camp the Hispar 400 bag by itself is rated at -9°C, warm enough for most summer nights in Europe or at low altitudes (like Baffin or coastal Greenland). When colder nights call for it, the Alpine Ultra jacket and Filler bag can boost the Hispar to around -20°C. 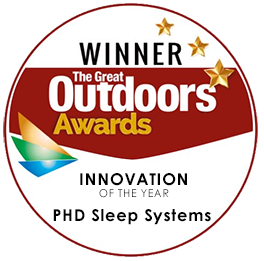 The system provides a useful safety margin without the need to carry a big -20°C sleeping bag.